A security guard hired by the St. Lawrence Market neighbourhood business improvement area (BIA) has been making rounds in the park, allegedly taking aim at the visibly homeless who spend their days there. For Richard Norton, home at least most days is St. James Park — but it hasn't felt that way lately. Norton is one of several of the city's homeless who take shelter in the public space, but recently, he's found himself ordered to leave by private security patrolling the area. "They're trying to clean up the park, that's what I think they're doing. It can be a bit ratty around here sometimes," he admits. "But truth be told, they're all wonderful people, they just have addictions." Since mid-June, a security guard hired by the St. Lawrence Market neighbourhood business improvement area (BIA) has been making rounds in the park, allegedly taking aim at the visibly homeless who spend their days there. But as a public space, the private security has no authority in the park, except to make sure the gazebo isn't occupied when the BIA has a permit to use it on Thursdays. "He's kicked people awake, told people they can't sleep on benches, or sit on benches," Ontario Coalition Against Poverty organizer A.J. Withers has been told by at least a dozen people in the past month. "I think that the BIA doesn't like the aesthetic and thinks that homeless people are bad for business and wants to get rid of them. So they're privately policing the neighbourhood and I think that it's absolutely unacceptable." Executive director of the St. Lawrence Market BIA Al Smith says the organization hired a security guard to patrol the area, including the park, as a part of a pilot project set to run until Labour Day. And so far, he says, it's been well-received among business owners. "They feel that safety has increased in the area. They were worried about certain elements and they just sort of wanted to minimize illegal and unsafe activities and that's what we wanted to do as well," he said. Smith refutes claims that the privately-hired guard told anyone to leave the park or indicated that they were banned from using it. "We don't act as police, we want to act as moral persuasion to minimize those illegal and unsafe activities," saying things like drug use, belligerence or drunkenness keeps people away. After what it says were mounting concerns that just who can use the park was being decided by a private organization, OCAP contacted the city. In an email shared with CBC Toronto, the office of late Coun. Pam McConnell told OCAP that Parks staff informed the BIA that they "were to stick to their permit," calling its actions a violation of park bylaws. "It is very disappointing that they have chosen not to do this," the letter from constituency assistant Claudia Calabro says, adding that the security has no authorization to ban anyone from the park or interact with park users outside of the permitted time. 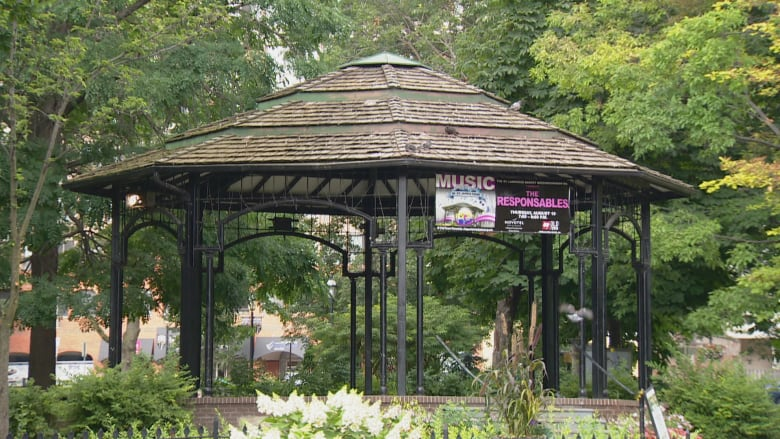 For his part, Smith says the BIA will no longer station a guard at the park except during permitted times on Thursdays, saying city staff has explained to him that being the landlord of the park, any patrolling would have to be done by the city. That's good news to Norton, who saw the guard as a threat to the availability of public space. But while the guard will no longer be stationed at St. James, Smith says a larger discussion has to be had about illegal activity in parks. "I don't know if that's security patrol, I don't know if it's increased presence by law officers, by police, I'm not sure what the solution is but we need to have that conversation now," he said. Next year, says Smith, a children's playground is being installed at St. James. "I can go there any day and pick up a handful of needles. That's not something I wish to expose any children to. So it's a conversation we have to have now. What is the solution?"